Editor's Note: This was supposed to be published, oh, around a month ago. Please excuse inconsistencies whenever I mention what time or day it is. Are you there readers? It's me, Kristen. Sorry for the recent slacking in blog posts, but what can I say- it's summer and I'd rather be playing outside. Sorry I'm not sorry. This past weekend, however, I did something a little more exciting- I packed up my mom's Highlander and with my heterosexual life partner riding shotgun (hey Layson! ), I drove to Chicago and moved into my glamorous new downtown apartment. Not going to lie, I felt pretty grown up... except for the fact that I was wearing a neon "SPRING BREAK 2011" tank. Bygones. Anyway, with a whole weekend to move in, shop, explore, and go to Lollapalooza, I had plenty of opportunities to get acquainted with my new city. In a nutshell, I think I'll like it. My goal for the weekend was to be a human sponge, absorbing tips and tricks for how best to blossom in Chicago. I'm just waiting to burst from my small town girl cocoon into a beautiful big-city butterfly. DO: Explore your city in a "long hair don't care" outfit. Example: After moving my stuff in my apartment (which miraculously took all of 30 minutes), Layson and I realized it was a gorgeous day and we wanted to play outside. So we went for a long, rambling walk all around the beach and Navy Pier. Right off the bat, we had an "oh, duh" moment. As in, "Oh, duh... Chicago is a lot bigger and more fashionable than Lexington." Swarming around us on the streets were lots of men and women dressed to the nines- even the workout attire was designer. What were we wearing? This tank top, but with neon yellow running shorts. After getting over the initial slight cringe at maybe sticking out from everyone else, I realized- LONG HAIR DON'T CARE. This is MY new city, I actually really love the tank I was wearing during my first impression, and if Chicago wasn't going to accept my 90s-esque fashion sense... well, screw it. Also, since I don't know anyone in the city yet it really didn't matter what I wore because probably going to notice. So there's that too. DO: Drink champagne while unpacking and putting together furniture. I don't really feel like I need to justify this. It's just better. DON'T: Develop a highly contagious disease on your first night in the city. Before dinner Thursday night, I noticed my eye was a little red and achy. I did the responsible thing and exchanged my contacts out for glasses, but there was a little voice in the back of my head warning me of what was to come. You see, as gross as this is (maybe even late night confession material), I somehow have a horrible tendency to get pinkeye. As in, I have had it multiple times in childhood and twice just during college (once during a New Year's eve celebration in Nashville and once at a fraternity formal in Canada two days before leaving for a month long trip to Greece. I have some sense of timing). Sure enough, I woke up the next morning with the scarlet "I," and immediately hustled Layson to the Urgent Care Center 30 minutes from my apartment (I had researched it the night before just in case). Diagnosis: mild pinkeye or possibly peri-something something. Luckily, this story has a happy ending because my illness cleared up quickly and in time for Lollapalooza (more later). Also, silver lining- I now have a local Walgreen's and I know where to go to the doctor in case of an emergency. All things I would have needed eventually, but would have appreciated not having to deal with on my first full day in the city. So take heed and use antibacterial soap often before a big move. Side note DO: Talk loudly on the subway about how you have pinkeye. Everyone around you will immediately jump backwards and give you much more personal space, which is never a bad thing. DO: Have some really fun event planned as a reward for all the hard work associated with moving. In our case, it was a Sunday ticket to Lollapalooza, a large music festival smack in the middle of downtown Chicago with 90,000 music fans wandering around. People were DECKED OUT in any type of outfit or costume you could imagine, and Layson and I immediately looked at each other and said "These are our people." Having Lollapalooza to look forward to made the whole weekend much more exciting than if we were just moving. Plus, it was a good way to get to know one of the city's signature events. Moving from Lexington (especially Transy) to Chicago can be adequately represented by this graphic. 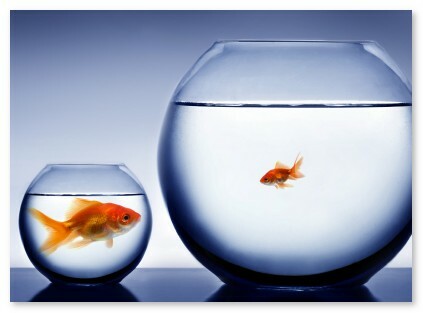 Big fish, little pond --> Little fish, big big big pond. BUT, it's really not that bad. Over time, little fish, you will find your little section of the pond that most suits you. Until then, have fun swimming all around the big body of water (but always with a buddy, as Patti Geil would like you to remember). Also, if anyone can get me a job waiting tables or something in Chicago, hit me up. Poor fish, expensive pond, not desperate enough to sell my eggs... yet.